Spray a 12 cup fluted tube pan with non-stick cooking spray. Pour 1/2 cup cajeta (goat’s milk spread or dulce de leche) in bottom of pan. In large mixing bowl, add cake mix, cinnamon, water, oil and 3 eggs. Beat with electric mixer for approximately 3 minutes, or until all ingredients have combined. Pour cake batter over cajeta in tube pan. In a blender, add 4 eggs, milk and condensed milk; blend at medium speed until all ingredients have combined. Pour flan mixture over batter. Cover bunt cake pan with foil and place in a large roasting dish. Place in oven and carefully add approximately 1 inch of boiling water to the roasting dish, making sure not to get any water in the bunt pan. Bake for 50 minutes, or until knife or toothpick inserted comes out clean. Remove from oven and water bath; remove foil and let the chocoflan rest for approximately 2 hours. Place a large plate or platter upside down over pan. Carefully and quickly turn platter and pan over, and slowly remove pan. Pour the remaining 1/4 cup of cajeta over flan, slice and serve. Flan can come in many variations, but one of my favorite ways to enjoy it is accompanied by a piece of chocolate cake. 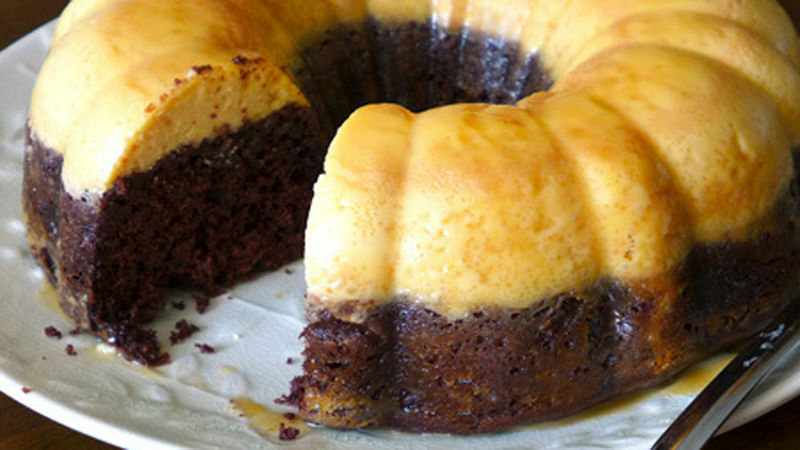 This chocoflan is also known as “Pastel Impossible”, due to the way the layers separate and settle in opposite directions during the baking process. The result: a beautiful, layered decadent dessert that will leave your party guests intrigued and asking for more. I found this flan recipe easier to prepare than regular flan because the step caramelizing the sugar is not involved, and “cajeta” (caramel spread) is used instead. So easy and so delicious! Serve it with a strong cup of black coffee and enjoy at any time of the day.